It’s no secret that I’m a big fan of babywearing, and I have a number of devices for toting babies around. My favourite is the amauti Michael had made for me in Pond Inlet, Nunavut, but it’s one I can use only in winter. Which lasts long enough around here, anyway! Jade’s starting to get a bit old to be carried everywhere, of course. She enjoys going out in the stroller when we’re out for walks, but often she spends more than half the walk on her own two legs. Often she likes to run off into tall grass or bushy trails where no stroller would dare go. She takes after her dad that way, I guess. I’ve experimented with various wraps and slings, but I have to say that so far my favourite is my Storchenwiege wrap. Slings are simpler to use, but you can’t beat the flexibility of a wrap. When Jade was born, I tried making one out of regular cotton because I didn’t want to spend what seemed like a fortune on something that appeared to be so simple; my make-shift wrap totally and completely sucked because it didn’t have the kind of give this wrap does. Anyway, I don’t want to sound like a commercial, and I know there are other great wraps and slings out there, but I’m bringing it up because yesterday the wrap came in very handy. I thought Jade’s wrap days were over, to be honest, but she was having a series of small seizures yesterday evening that had her very emotional. Oftentimes when she has a little seizure, she comes out of it and simply carries on with what she was doing, as if nothing had happened. (Indeed, it’s quite possible that she has no idea that anything did happen.) Other times, she gets sleepy. And sometimes she gets cranky and emotional, and I can tell she’s uncomfortable and feeling out of it. She can’t tell me how she’s feeling in words, but she cries and wants to cuddle and is very upset if I try to leave her for any reason. Like, for example, if I’m in the middle of barbequeing a steak and frying potatoes, and I’m trying to go attend to them. Which is what I was doing last night when Jade absolutely would not let me put her down without freaking out. Since Michael’s still on the road (on his way home now, though — hooray!) I couldn’t call on him to take over the cooking. So downstairs I went with Jade in my arms and dug out the wrap from the back of her closet. I put her in a backpack carry (which Michael is demonstrating in the photo below, although he doesn’t have it tight enough, which is why he’s bent over). Jade cuddled right up to my back with a doll in her arms. When I went to check things out in a mirror to ensure she was secure (it’s been a while and my technique is rusty) she actually peeked her head out and giggled, a rather drastic contrast to the hysterical goings-on of a few minutes earlier. I was able to finish cooking supper this way, and got the table all set and medications ready. When I asked her if she was ready to eat, she said, “Mmm hmm!” agreeably and sat right down and ate with gusto. You may have heard of kangaroo care. This is the practice of carrying babies around close to the mother’s (or father’s) body, with skin-to-skin contact. Apparently premature babies who get kangaroo care tend to gain weight faster, learn to regulate their breathing sooner, and are released from hospital earlier than preemies who spend all their time in incubators. Jade’s far from being a preemie, of course, but it is interesting what a calming effect it still is for her to be carried close. Thank goodness for babywearing. What a beautiful amauti. 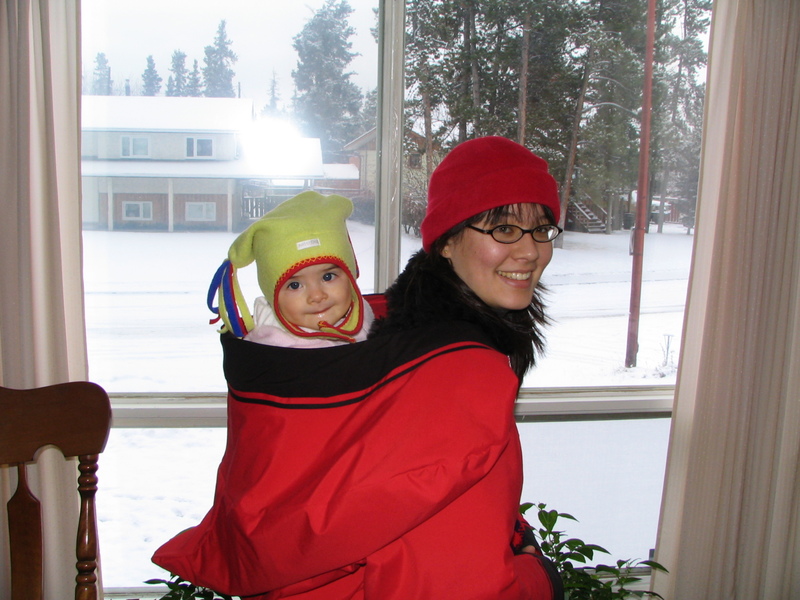 I lived in Iqaluit (at that time called Frobisher Bay) for three years and often thought about having one made for me, but at the time I was in my early 20s and babies were several years away, so I couldn’t really justify it. Later on of course I would have killed to have one, but by that point we were living in the Yukon. I did have a sling though and it helped get though many a difficult time with my three. Hmmm – I wish someone would invent something like that to calm emotional teenagers!! I didn’t know you used an amouti too! I absolutely love mine to death. I cannot wait for winter to use it again! I know what you mean about the wrap carrier being so great for calming babies (and older ones too!). Elias wanted Eric to carry him around in our wrap carrier the other day – a bit of nostalgia there, as well as wanting to be held like the new baby! Also, I just wanted to say that our store, Due North Delivery, is carrying wrap carriers made of organic cotton, and that I can special order the Storchenwiege you talk about and hope to have a few on hand soon! Thought I’d mention that for any interested readers who might be wondering where to find a wrap carrier in Whitehorse. Oh, also, I’ll be getting in some babywearing coats for the fall – not these fantastic ones made in Canada though. Fawn, I’ll have to find out more about them from you! I am also a huge fan of baby wearing! The stroller is OK, but babies want to be held and having use of both arms while holding is always a bonus. That is really so cool. I always thought wraps looked fun and functional….but I guess I was always too chicken to try and figure out how in the world you wrap it so the baby doesn’t fall out!! Maybe when Nugget arrives you can give us a pictorial on how to wrap the wrap…if that makes any sense! I love the idea of kangaroo care. I did it with Lincoln, starting on his 4th day of life, even though he was 1 lb. 7 oz. at the time and on a ventilator. Thankfully, the nurses at the hospital where we were wanted me to do kangaroo care and allowed us to do so. Lincoln would completely rest on my chest and I loved watching the monitor’s numbers as things ALWAYS got better while he laid there. Thanks for posting this and reminding me of it. Glad it’s working for you too. Wow! I learned something I haven’t heard of the wraps you are talking about. I like the wintery one. Thanks for sharing and I love babywearing. I found you via Adventures in Babywearing, and I just wanted to say *hi* from another (almost) arctic mama! (I live in Alaska). The town I’m in has no cars–it’s little and we walk everywhere. Babywearing has been invaluable here! I love your pictures! What is the cover you are using? I have never seen that before! That looks awesome! Wow! I am always SO amazed at how incredibly beneficial babywearing is. It’s not just for convenience, and being “hands free.” And I love that you can wear one baby on your back while growing another one in the front! 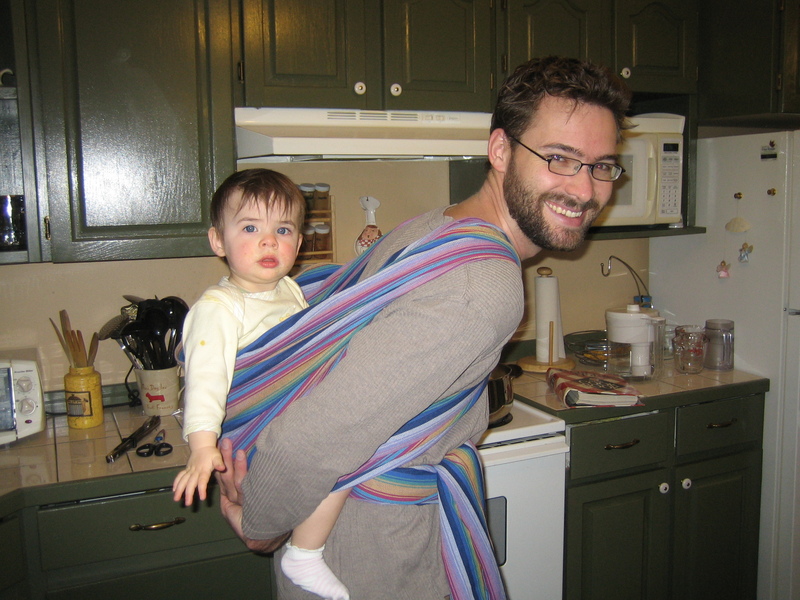 Babywearing is such a wonderful thing! I’m so glad it’s becoming popular (again). I’m glad wearing Jade soothed her.